With the warmer weather, it is a great time to grab some rods and head out to fish. Whether you are a serious fisher, or just looking for a nice relaxing afternoon, we've put together a few great places around Rabun County to consider. 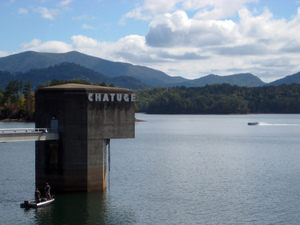 Lake Chatuge is a 7,050-acre Tennessee Valley Authority reservoir located on the North Carolina border. Fishing and boating regulations are restricted to the waters governed by each state, so anglers must pay careful attention to laws. Fish attractor data (updated Oct. 2014) for this reservoir is available for you to upload into your fishfinder or other GPS devices, or view in free online mapping applications. The data is compatible with many brands including Lowrance, Humminbird, Garmin and Magellan to name a few. Instructions are here on how to use the data. Spotted Bass, Largemouth Bass, Hybrid Bass, Bluegill, Catfish and Carp. Lake Tugalo is a beautiful 600-acre lake formed by the Tallulah and Chattooga rivers. Owned and operated by the Georgia Power Company, Tugalo is on the South Carolina border near Clayton. Outboard motors are restricted to 25 horsepower. Largemouth Bass, Walleye, Redbreast Sunfish, and Bluegill. The Chattooga is a tributary of Weiss Reservoir. It originates near Lafayette and meanders about 51 miles southwest. A narrow river channel with numerous hazards makes most of the river floatable only by canoe or small boat. Large prop and jet boats can navigate the river below Ga. Hwy. 27 with caution. Bream, Black Bass, Striped Bass and Catfish. 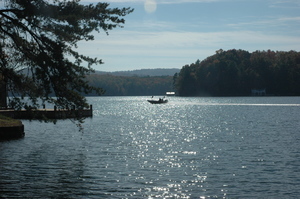 Lake Rabun is an 834-acre lake located a few miles downstream of Lake Burton near Clayton. This mountain reservoir is long and narrow with miles of steep, rocky shoreline. The upper two miles of the lake are relatively shallow and contain mud flats with weed beds along the river channel and long sections of blown down trees. Spotted bass, largemouth bass, bluegill and shellcrackers are favorite targets of local anglers. Largemouth Bass, Spotted Bass, Bream and Walleye. Lake Burton is a 2,775-acre reservoir near Clayton featuring beautiful scenery and large lakeside homes. Managed by the Georgia Power Company, this lake holds an impressive quality spotted bass fishery. Burton is home to the state record spotted bass catch - a whopper caught in February 2005 that tipped the scales at 8 pounds, 2 ounces. Guide to Lake Burton Trout Fishery available in PDF (395 kb). This guide discusses tactics and offers expert tips for fishing Lake Burton in spring, summer, fall and winter. Spotted Bass, Largemouth Bass and Brown Trout. Lake Seed is a 240 acre run-of-the-river type lake near Clayton that is operated for hydropower by Georgia Power Company. Walleye and trout are the featured species in Lake Seed but spotted bass, yellow perch, white catfish and trophy redear sunfish also take up residence. Summer stratification does not occur in this lake because water flows through the impoundment at a rapid rate. Coolwater fish, like trout and walleye, will often be found within a few feet of the bottom all year long. Trout will feed on the surface under low light conditions in the cool weather months and walleye will move also move into shallow water under the same conditions. Anglers Guide to Walleye Fishing in Georgia (847 kb). This guide discusses tactics and offers expert tips for catching Walleye in Georgia. A walleye fishing guidebook is available at no cost on the Wildlife Resources Division web site athttp://www.gofishgeorgia.com/Fisheries/Walleye?cat=2. Click on the link at the bottom of this webpage to download the guidebook. More information about Lake Seed can be found on the Georgia Power website at http://georgiapowerlakes.com/northgeorgialakes/. Content courtesy of the Georgia Wildlife Resources Division.